Before I begin I have to admit that this tie-dye was a fluke. When I started I didn't know what I was doing or how I was going to do it. I only knew it was going to be a tie-dye. So that's the reason why it's called 'block print tie-dye', I wasn't sure what to call it. But it is pretty cool right? Remove the rubber bands and dry the shirt. I cut off the collar and shortened my t-shirt because it was a large mens size. Nice job! Not too much, not too little. Just the right amount of color. 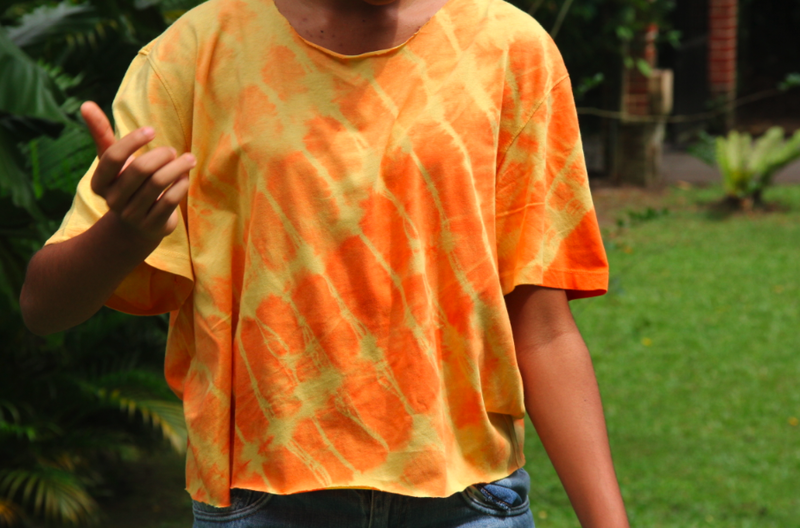 I'm not a big fan of tie dye but I love the block print. i remember doing this in high school! haha - sweet! You're quite the talented wee DIYer - LOVE your yellow shirt dress! I love it! It really gives a modern and expensive look to a trend that has clearly been worn out through the years. Great job! Oh, and I wonder who took those amazing photos. They are just so talented. Wow, this looks so cool! amazing project! This looks like fuuuuun!!! I should try doing this in a pink shirt and black dye :) cooool.. Your blog is cool!!! Great Blog! Love your DIY. Very cool ideas! I would love to follow you! This is great !! i want to do this!!! The shirt looks great!! It is so fun to create your own looks! You've got a talent! So lovely blog! Very cool! You have a nice blog as well. Wanna follow mine? That worked out so well! I think the t shirt looks ace! I wish my flukes turn out so good. Great job! cant wait to try this over the summer! Hi, thanks for your lovely comment in my blog. This post is incredible, u are so inventive.